Another year is nearly over and we would like to wish you all a merry christmas and a happy new year! How are things going? Well, the low activity in the market has also effected CRE8 and our turnover is significantly lower than the peak years before. Nevertheless, CRE8 has adopted a proactive attitude, looked at the possibilities the situations opens up for and thereby launched several innovative and cost saving solutions. The market has responded very postively and we recently delivered the CRE8 Flexible Wellhead Panel to Oseberg Vestflanken. Our Increased focus on research and development has also resulted in a Chemical Injection Package including the latest technology within chemical injection control products. 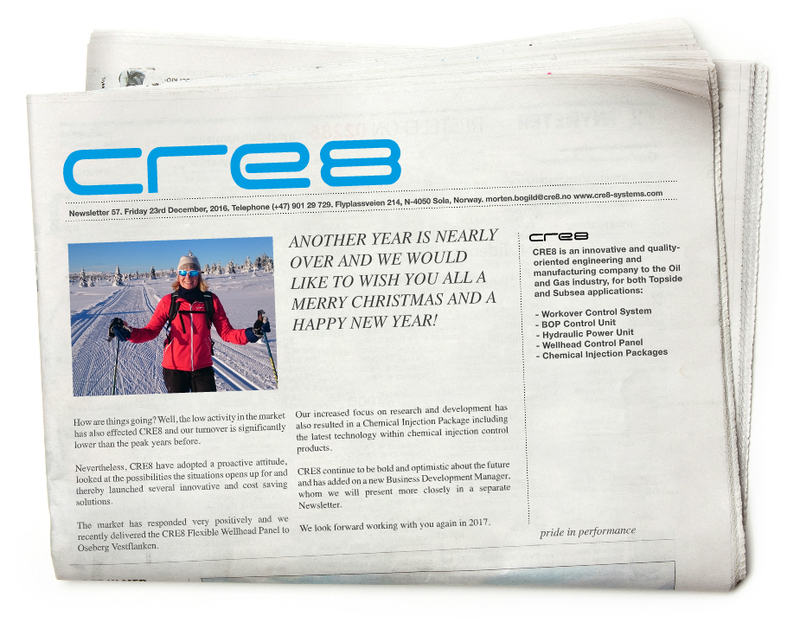 CRE8 continue to be bold and optimistic about the future, and has added on a new Business Development Manager, whom we will present more closely in a seperate newsletter. We look forward working with you again in 2017.